Last weekend we saw outstanding performances posted by our members at Ironman Cairns, Ironman 70.3 Cairns as well as here at home at the annual City 2 Surf Fun Run. Congrats to all participants particularly to those going the distance for the first time! Shout out to Hannah Johnston who qualified for Ironman World Championships in IM Cairns and will join Jac Crofton & Corinne Fabian on the famous start line at Kona, Hawaii in October. Good news also for Jim Eadie who secured a slot for IM 70.3 World Championships in Austria later this year. 1. Wetsuits are permitted for this event. 2. Darwin Surf Lifesaving will be providing water safety for our event on Sunday. They carry out regular netting and sweeps of the beach & along with the Harbour Management team have assured us the area is safe. 3. The Blue Cycles team will be helping out at our event again on Sunday. Thanks Blue Cycles. 1. It's that time of year when we get together for our annual dinner and also to look back on our 2014 | 2015 triathlon season. Belinda Townend is busy arranging some super catering for the night. Ironman Performance, Champions, Dag of the Year, Broken Spoke Award, Encouragement Awards etc. 3. Tickets are now available online here. 4. Member tickets are heavily subsidized so do come and join us. Perfect opportunity to find out what people look like sans lycra! 5. The location is same as last year & where transition has been located for our duathlon events. 6. It will be a family friendly, casual evening for all to kick back and enjoy! We hope you will join us. 1. 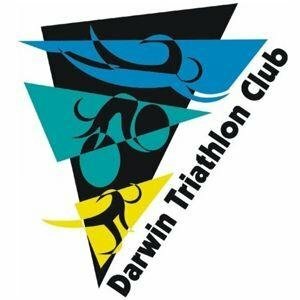 Various opportunities exist for individuals and businesses to support Darwin Triathlon Club and be recognised as a club sponsor. 2. 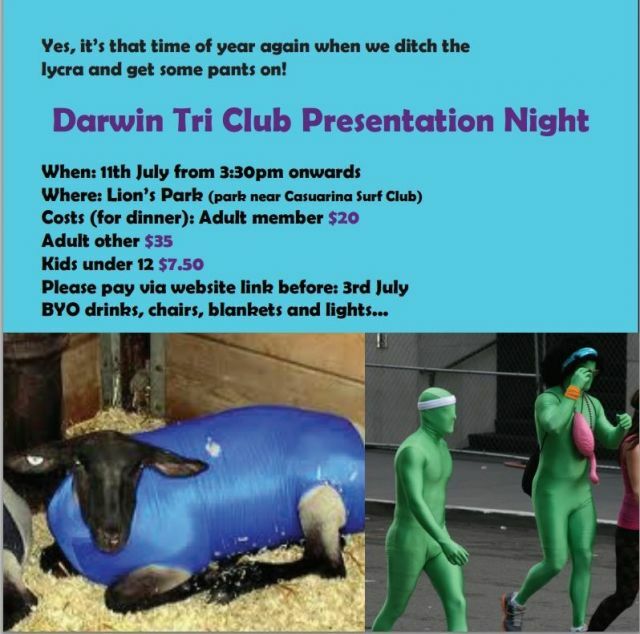 Please email darwintriclub@gmail.com for further information. 1. Spotted: Stef Puszka featured in the latest edition of Australia Triathlete magazine. 2. Spotted: Graeme Parsons & Ryoko Jones in Pole Top Rescue's latest video release. 3. Coming up: Triathlon NT's NT Long Course Triathlon, Sunday 5 July 2015, 2km swim, 60km ride, 16km run - which just happens to be also perfect timing for those training for KUC. Further info and online entry now open here. 4. Sandwiched royalty: Ange Castle and Hannah Johnston bookended royalty in the IM Cairns finish chute, with His Highness Sheik Nasser Bin Hamad Al Khalifa of Bahrain finishing between them. 5. Impressive podiums at the weekend also by Jac Crofton (3rd), Sarah Collins (2nd) and Clare Labowitch (3rd) in their respective age categories at IM 70.3 Cairns. Congrats. 6. Entering an interstate or overseas event? Do give your address as "Darwin" with your suburb postcode. Announcers are familiar with Darwin and usually give us a shout out. Helps raise our club profile and people then take a look when we have our major events in the Top End. 7. If you know, or have heard of, a suitable nominee for our Dag of the Year [self explanatory] or our Broken Spoke [bike crash] awards (all nominators remain anonymous so no fear of retribution) please email the details to darwintriclub@gmail.com. The daggy deed or the spectacular stack needs to have occurred between 1 July 14 to now. The more the merrier!! 8. Congrats to Jo Ellis & Jordan Phasey who recently announced their engagement. 9. Entry for Challenge Melbourne 31 Jan 2016 now open. 10. 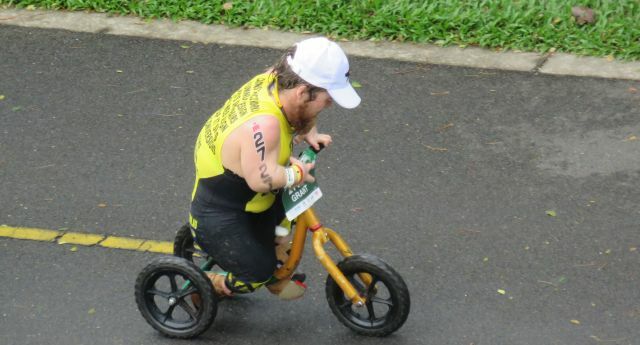 A top junior DTC triathlete back in the day, Joey Ryan has been spotted around town. 11. Want to participate at our event on Sunday but not a member? Join now now here & you are able participate on Sunday and your membership is valid through to 30 June 2016!